Big, well organised sporting events are great. We take so much for granted when we go to a premiership football match, or Wimbledon, or a big athletics meeting. We just go and see the best athletes in the world at their chosen sports competing at the highest level, with all the bells and whistles. And it's brilliant. 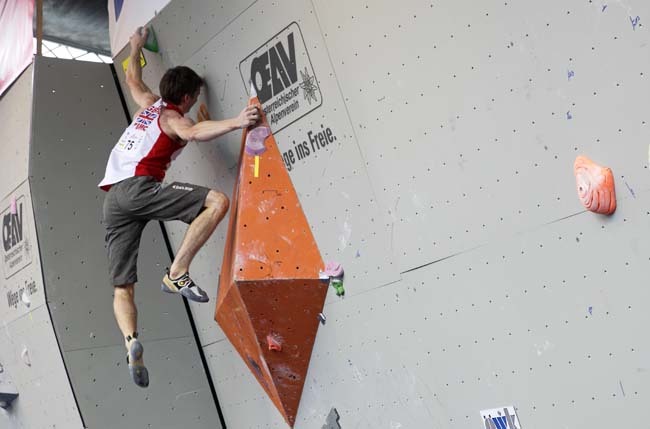 The lead climbing competition took place on the amazing new outdoor competition wall in Imst - a wall so big, steep and impressive that you suddenly realise why the Austrians are so good at climbing. With the level of government funding for facilities such as this (€1.5 million, someone told me! ), it's no wonder that the place is a breeding ground for climbing talent. If the Imst wall was your local climbing wall, all of its customers would be climbing 7b's within a matter of months, or they would have taken up another sport (which is the common misconception about so called "elite level" sports facilities). Rather than being off-putting, this type of climbing facility is so inspiring, I defy you to show me a psyched young climber who would not be motivated to train and get better at their sport after a trip to this place. It's awesome. Meanwhile, over in Innsbruck the bouldering competition was taking place. As with the lead event, the Austrians had made an enormous effort to make this event as big a spectacle as they could. So they put their bouldering walls on a stage in the middle of Innsbruck's Martplatz, next to the river with a backdrop of beautiful mountains. Then they put an enormous roof over the whole market place (no small feat of engineering) so in the event of rain the thousands of spectators in the grandstand seating would not get wet! Add a few giant TV screens showing replays of the action and live results, loud music and a hugely over-excited commentator, fancy lights and a big beer tent and you have the recipe for an amazing sports event. 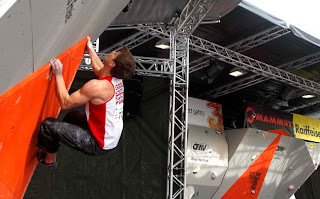 The only other climbing competition in the world that puts as much effort into making their event such a big show is the Arco Rockmaster, but I'm sure that the 2010 European Championships knocked that event into the proverbial cocked-hat in terms of scale and excitement. Traditionally when writing a competition report, (and I have written many over the years), I should now tell you what happened, and who won and lost and all the details, but to be quite honest I get the impression that nobody in the UK really cares, so I'll just list the winners at the bottom of the page. 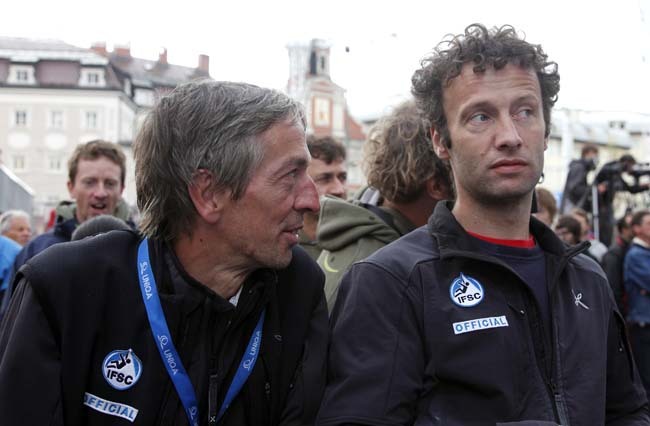 However, let this serve as a timely reminder to the powers that be in charge of British competition climbing (your very own BMC) that the UK had no representatives in the Lead climbing event (an event won by Ian Vickers in 1998 when we still cared about competitions) and currently doesn't have any sort of senior lead climbing team. Our bouldering team is still going somehow given the lack of funding from our sports governing body (again, the BMC) and we did pretty well considering. Stewart Watson even managed to get 8th place, but then again, he now lives in Austria and so can make use of proper training facilities in a country that treats competition climbers as proper athletes. I hate to be down on the UK climbing scene because I love it so and I hate being so negative, but whilst the rest of the world is on-sighting 8b+, and climbing 9a's is a pretty common occurrence that would get little or no publicity in the foreign climbing media, us Brits still get excited when somebody redpoints an 8c. French school-girls onsight 8c, for goodness sake! 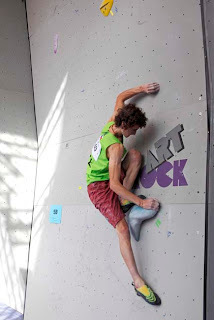 Adam Ondra trying a Bishton Slab - he managed in the end! Sam and Claire are currently setting some new Blacks this morning. This circuit will be finished by tomorrow with a few additions from Percy. A good mix of styles in this circuit. With the seasons changing and the cold wind about to start blowing, it's also that time of year when you see the Works shop clothing range start to alter. Already into the shop we've taken delivery of the new Autumn Winter Prana range. True to their core values, Prana have a wide mix of products from Organic cotton tee's to cord pants. Some of it has already ran off the shelves with the Phlox Reversible Crew shown below already sold out in one colour (we should have more in by end of next week). If you're looking for something different than a crew or hoody this year, check out the Prana Hemlock Flannel shirt. A heavier weight, 100% organic cotton, allows this to be a great shirt to relax in between burns at the wall....or simply to relax in on an Autumn evening. Very nice it is too. We've got the full range instore with more going on the website every day. Feel free to check it out next time you're in the Works. On Thursday 26th August, The Climbing Works held its 2nd Young Climbers Festival, an event to mark the end of the holidays and to thank all those who participate in our regular kids clubs or holiday courses. It all kicked off at 9.30am with the young climbers, all aged between 7 - 15, getting motivated and warmed up with fun games and challenges. complete 10 - 15 climbs selected from the new green and pink spotty circuit set earlier in the week by David, Claire and Michelle. The problems ranged from Font 3 - 6C and included a mini dyno, technical slabs and tricky arÃªtes. Points were awarded for the least amount of attempts taken on each problem, and spot prizes given for dramatic falls, encouragement given and best attempts. The main emphasis of the day was to have as much fun as possible; all the young climbers had awesome attitudes towards the event and supported fellow competitors with lots of cheering and helpful beta. The instructors were also very impressed with the climbing skills, problem solving and perseverance shown by every single competitor. By 12pm everyone had completed their climbs, scores were counted, certificates were written and prizes and medals were handed out to the top 3 climbers from each group. Everyone went home happy and tired! Thank you to all the young climbers that made the YCF 2010 a big success. Also big thanks to all theinstructors who helped out, the route setting team and our sponsors, Moon Climbing for supplying the prizes, and 5 Finger Thing for supplying the YCF T-shirts. 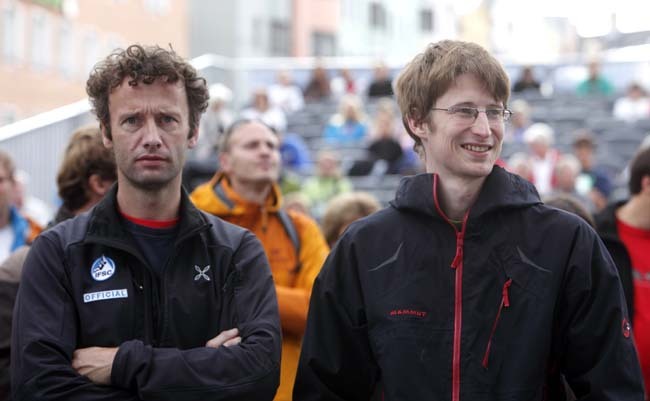 Festival, make sure to keep an eye on www.climbingworks.com/events and our blog for the latest information. Last weekend we had the British Bouldering Team in for a rehearsal before the European Championships which take place on the 17-19th September. The days consisted of getting on the Berghaus Competition wall and attempting (in competition format) the problems as set by Percy. There were semi-final and final level problems for both the Men and Women. 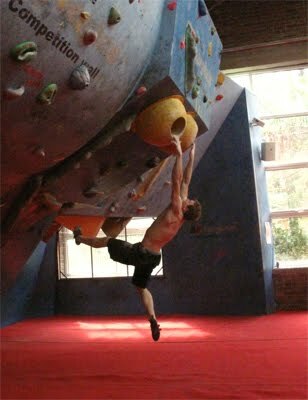 As you can see below Percy created some interesting blocs with kneebars, crimps, dynos and slopers. A little bit of everything really. Now that the British team are done with it, it is now open to you to test yourself against them. Don't worry though as there are some easier stuff on there to warm up on. There's actually so many problems on the wall at the moment we've made 2 topos for the Berghaus Competition Wall. There is the one for the British Team set (marked start holds, semi or final standard etc) and one with the easier stuff. Both are on the mats below the wall. Go and enjoy!